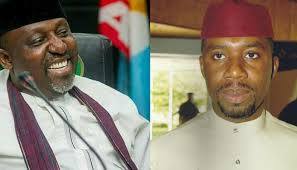 After one week of political horse-trading, the immediate past chief of staff to the governor of Imo State, Uche Nwosu, has been declared the governorship candidate of the ruling APC in the state. His father in-law and incumbent Governor of the state, Rochas Okorocha, was also elected as the party’s senatorial candidate for Imo West Senatorial District. This is coming after the National Working Committee had cancelled the earlier primary which produced two aspirants — Senator Hope Uzodinma and Nwosu — as candidates and ordered for a rescheduled primary on Saturday. Announcing the results of the rescheduled primary at the APC Secretariat in Owerri in the early hours of Sunday, the chairman of the electoral panel, Ibrahim Agbabiaka, said that Nwosu polled a total of 269,524 votes to defeat eight other aspirants. According to him, the primary held in the 305 Independent National Electoral Commission’s wards across the state. Agbabiaka said that other aspirants, Uzodinma, got 2,729 votes; the deputy governor of the state, Eze Madumere, 2,646 votes; Jude Ejiogu, 3,656 votes; and Chris Nlemoha, 925 votes. Peter Gbujie, according to Agbabiaka, scored 4,855 votes; George Eche, 2,445 votes; Chima Anozie, 3,248 votes and Chuks Ololo, 6,428 votes. Uzodinma and five other aspirants, Madumere, Gbujie, Nlemoha, Eche, and Ejiogu had, on Saturday, announced that they would not be taking part in the rescheduled primary, saying that they were sticking to one of the results of the first contentious primary which was cancelled by the APC's NWC. The panel also announced that Governor Okorocha polled 141,117 votes to defeat Uzodinma and Osita Izunaso, who garnered 1,359 and 24 votes respectively. They also announced the immediate past commissioner for information in the state, Prof. Nnamdi Obiaraeri, as the winner of Imo North senatorial primary. The panel disclosed that the professor of law got 67,438 votes to defeat the incumbent senator for the zone, Benjamin Uwajumogu, who got 5,743 votes. Emma Ojinere was declared the winner of Imo East senatorial primary, having scored a total of 41,562 votes, as against Chima Anthony who got 37,815 votes and Max Igwe’s 275 votes. Nwosu, in his speech shortly after he was declared the winner, said that he would immediately commence the process of reconciling with all the aspirants who lost out to him in the primary. He declared his emergence as a major political milestone in the annals of political history in the state, saying, “To my fellow youths, I am holding this mandate in trust for you. I shall not let you down.